Of all the more than 200 rounds of golf Barack Obama has played as president, his outing on Saturday will probably prove to be a highlight: Teeing it up with New York Yankees great Derek Jeter. Obama’s foursome included Jeter, Brian Greenspun, who is owner of the Las Vegas Sun, and businessman and Democratic donor Stephen Cloobeck. They played at Shadow Creek Golf Club, an exclusive course owned by MGM Resorts International. Jeter retired from the Yankees in September after a Hall of Fame career. 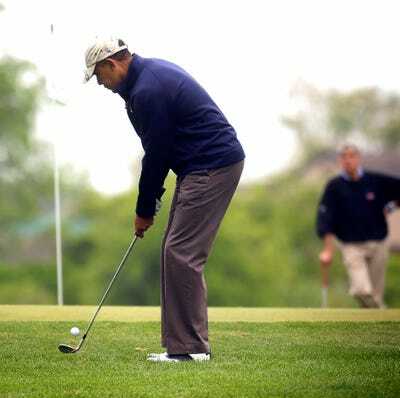 His golf game will likely need some improvement. A 2006 Golf Digest ranking of athletes who play golf put Jeter’s handicap at a pedestrian 30. Obama stayed in the Las Vegas area after delivering a speech about his immigration policy at a high school on Friday. He returns to Washington on Sunday.